Games like today - the opener of the American League Division Series - were why the Red Sox brought Chris Sale in. Let's hope there's a Plan B. Sale (pictured) served up three home runs - two of them in the first inning - in Houston's 8-2 win Thursday at Minute Maid Park. The first inning was bad all around for Boston. Designated Hitter Eduardo Nunez had to be carried off the field just two batters in after aggravating a right knee injury. Jose Altuve took Sale deep twice, once in the bottom of the first and again in the fifth. He hit a third home run in the bottom of the seventh. The Red Sox scored single runs in in the second and fourth innings on an RBI single by Sandy Leon and a sacrifice fly by Rafael Devers. 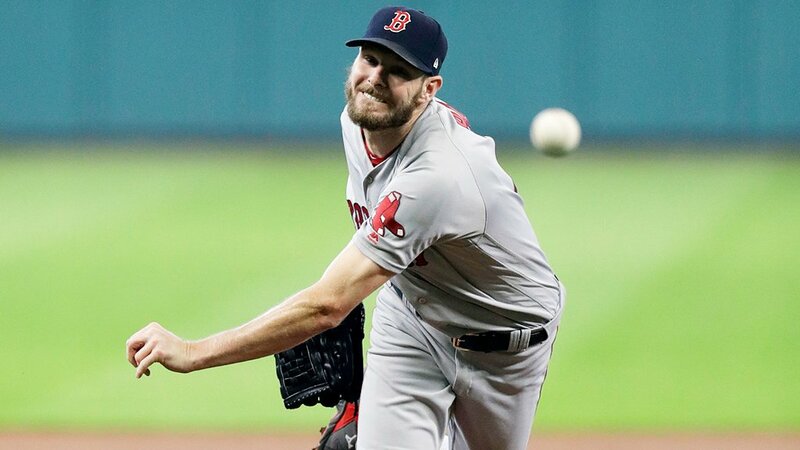 Justin Verlander went six innings for the win, scattering six hits and walking two while striking out three..
Sale went 5+ innings, charged with seven runs on nine hits. He struck out six and walked one. Rick Porcello came out of the bullpen to throw a clean eighth inning, which probably means he will not start should the Red Sox force a Game Four. The Boston offense was inept. Leon, Mookie Betts, and Hanley Ramirez, who got into the game when Nunez went down, each had two hits.